Up above East Hollywood rises an incongruous hilltop, crowned by the Frank Lloyd Wright-designed Hollyhock House and some city art programming buildings. Barnsdall Art Park has a view of the Hollywood and Silver Lake hills, with the Griffith Observatory and another FLW house looming across Los Feliz. 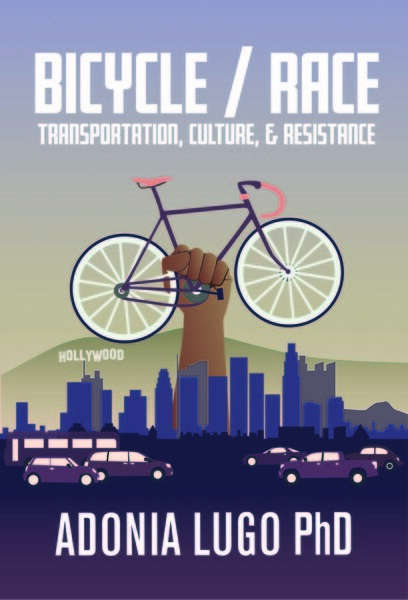 There've been some recent bike-related shows going on up there, but since I've been mostly out of town on the weekends I didn't make it up until Sunday's closing of "The City Re-Emerged When We Arrived," a music-film collaboration between several of my neighbors at LA Ecovillage. Aurisha Smolarski-Waters and Somerset Waters, the violin and cello voices of Telematique Ensemble, composed a score to accompany images by Doran McGee, a video artist. Federico Tobon also contributed, to the visual element, I think. So here's how it worked: one person mounted a rusty old stationary bike repurposed for the exhibition and another two perched on the cart behind it. Whenever the bicyclist wanted the cycle of photographs and moving images to go forward, she pedaled forward. Backward, backward, etc. Across the screen flashed images of an older Los Angeles, pastoral landscapes inhabited by pretty ladies in 1920s garb and bursting flowers that bloomed in time-lapse acceleration. The images visited Bimini Place, home of the ecovillage and the site of the Bimini Baths. The sounds followed the rhythm of the cyclist as well. Musically, the strings interplayed deep tones from the cello and piercing strands from the violin, frenetic at times according to pedal speed, and sometimes contemplative. Telematique manages to capture registers of serial composition and melodic pop, according to their whim, and in this case they sounded appropriately like Philip Glass, their counterpoint heightening the pathos of Los Angeles' many years of burying its own legacy of natural splendor. And of course, the bicycle. The bicycle allowed the participant to make connections between a rich history and a present landscape marked by barriers to its passage. In the exhibit, the bicycle moved me forward into a past where there was an opening not taken, that moment before the car usurped the bicycle as a vehicle for urban transport. Now we have an opportunity to reclaim that possibility, to enact our own vision of a more splendid and equitable city where we share space instead of bypassing it. Many thanks to the artists who made my Sunday even more pleasant. I'd already hiked up to the observatory with my mom and little sis, and we caught the weekend trolley back down to Vermont/ Sunset station, which is around the corner from Barnsdall. So they got to enjoy the piece as well before they Metro'd back to Union Station to get the afternoon Metrolink home to Orange County.